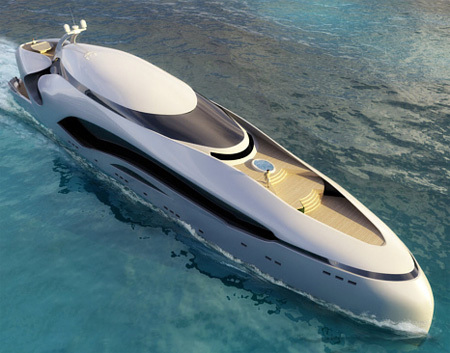 This amazing Oculus yacht design by Schopfer Yachts is really an amazing looker that literally can be said to be a design of the future. 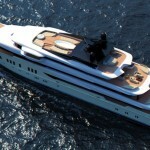 This 250 foot long yacht has luxury written all over it, be it the design or the interiors. 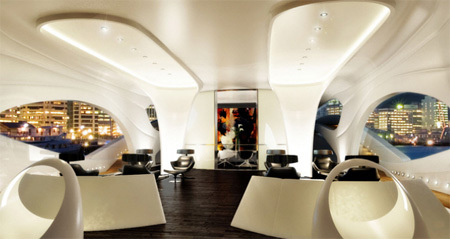 In overall design, the added effect with the 12-foot high dome shaped ceiling is simply mesmerizing. 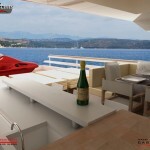 The yacht is divided into three levels with the ground level being a common area for the guests to be entertained and the second and third level being private for the owner if chosen so, which are subsequently connected by stairs. All one can say is welcome to indulgence! The exterior styling is representative of the jaw and eye socket bone structure of large oceanic fish and mammals. Featuring a dramatic reverse bow configuration, the yacht’s armature balances an elegant expression of symmetry and structure. 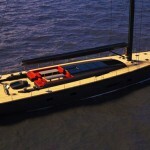 In addition to the bow, Oculus also features a “low rider profile”. This slightly lowered surface allows for new side recreational areas, alternate dockage access and light cruising openness. Lateral retractable side panels close this area when heavier wave action is indicated. 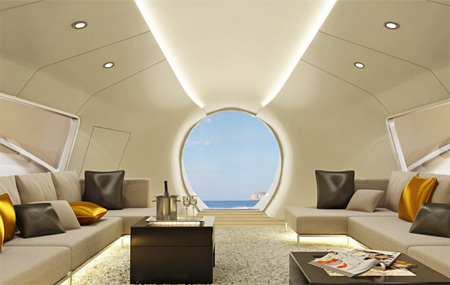 The interior features of Oculus focus on a 12 foot high ceiling in the main salon, a cylindrical double height dining room, central stair and elevator tube, and seemingly anatomical ceiling and floor lighting extensions giving definition to the seating areas. In addition to the main common stair, the second Owner’s stair connects to the third level aft private salon and deck / water feature. 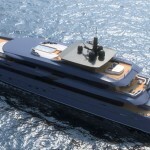 The third level also contains the forward pilothouse and separate captain’s quarters. The generous open decks with separate water features are located forward and aft for convenient guest use. 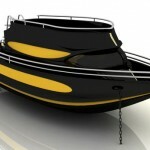 Specifications and plans are in the final stages of completion and will be posted at a later time. 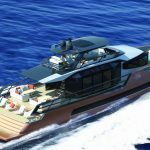 Tagged as artistic yacht, elegant expression, exterior styling yacht, floor lighting, foot vessel, futuristic yacht design, luxury yacht, modern yacht, oculus yacht, rider profile, symmetry and structure, yacht design. 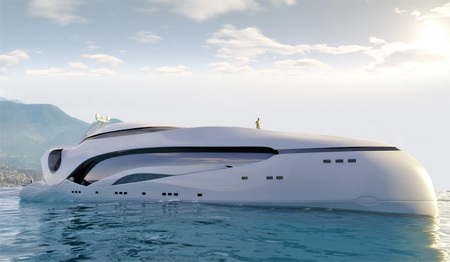 Id love to charter this, but too I recall seeing on Trendhunter a submersible yacht. Now that Id love with this model. 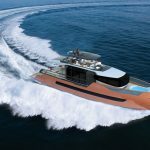 Add Biofuel engines & azipiod drive pods & bow thruster fwd than were cooking. Nice to use for 007 movie. Great for HI, Mexico, Caribbean , Med Sea use. Yeah I purchased this last week! It's kinda nice! 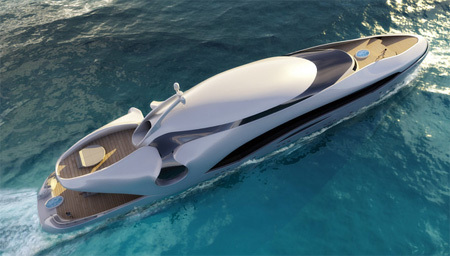 2nd terrific boat ive seen on this site! very great. Jessica, dont try to fool people and pretend that you are someone your not. 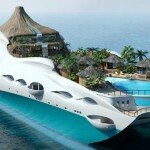 If you truely did own this boat then you wouldn't really be announcing it. Rich people dont show off their money, and if they did, they'd learn their lesson faster then lightning. Wow. You are a moron. I heard that Jessica has two of these. I have four. It is called sarcasm you dim bulb. What program was used for this design? 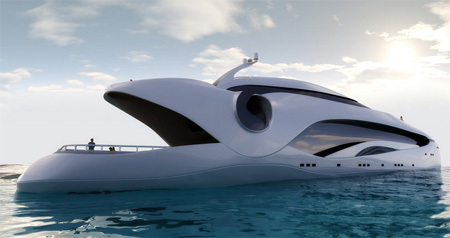 Good design, would want to know and see how it handles especially in very rough waves. Both the interiors and exterior are looking fantastic. 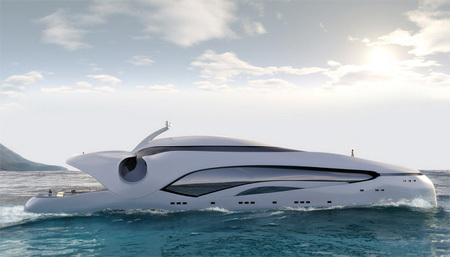 If this will be the future of luxury yachts as toys, then we are heading into an even more delightful experience. The other one looks like a whale? I don't know if it's just me but it kind of looks like a flat iron to me. I just hope it functions really well because it would outweigh aesthetics at any given day.